DIYEFI.org Forum - View topic - NAS goodness! I can't wait to get these babies fired up! NAS Manual attached for your reading pleasure. Location: Se oli ainakin näiiiiiin iso! I assume someone else pays your electricity bill. :) CX300 I installed back in early 2005 is still running and can't remember any unplanned outages due storage. Bunch of broken 73G 15k FC and 250G 7.2k SATA disks over the years tho. It's not bad device, especially after realizing that CX300 is simply Windows XP with software RAID running on 800MHz P3 or so. I don't know how familiar you're with it but you can login to SP with pcanywhere and goof around. 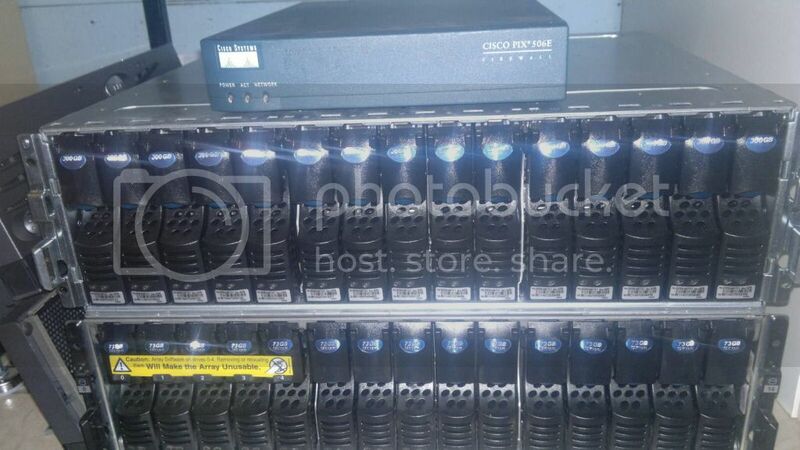 As for your PIX-506E it's intentionally restricted to old firmware versions by Cisco. PIX-515E which is based on same motherboard can run newer versions. Difference lies in bios chip that contains serial number and device model, 515E having double amount of flash (so no PDM on 506E after upgrade) and 515E having PCI riser for extra network interfaces. I upgraded one 506E ages ago with 1GHz P3 (133 FSB) CPU that ran 750MHz due 100FSB limitation of Intel 440BX based PIX-506E/515E and added few 128MB dimms from same old Compaq that donated CPU. Then I patched 8.0(4) firmware to support 506E hardware. That was easy part, just do search-and-replace on code after unpacking it and change all occurances of 506E to XXXX and then another pass with 515E to 506E. After that firmware will think it's running on 515E and won't crash on boot like it's told to do when detecting 506E. You'll also get few VLANs more as base license for 515E is more permissive than base for 506E. Original activation code will still work. After editing firmware you can either recalculate checksums for patched firmware or disable checksum checks. Below some of my notes from over 5 years ago I managed to dig up. That'll take care of checksums and allows one to freely modify firmware in future. There's always recovery possibility via bootloader and going back to 7.0 series firmware so it's not permanent modification. # than old one when using this method to hack firmware. # This will skip entire call to check validity of image. # and it crashed early on boot. # by bootloader. Here we compress using bigger dictionary to gain some space. # (7436288-7375727-25136=60561) and we need to pad that much. # just like we did with actual uncompressed firmware above. # Done. Enjoy your new PIX-OS 8.0(4) image without checks for image validity. the PIX unit I have has a dead external PSU. Sourcing another when I get time (not a priority at present). OK so I have decided to build myself a smaller NAS setup. So the above is up for grabs to anyone who is willing to cover the freight costs from me to them! (may include some really small packaging costs depending on how you want it packed). I got it for nothing so I will not charge any forum members on here anything for it. You pay for freight, it is yours! So if i understand this correctly, these take SATA drives as well as FC drives? What would shipping be to little old NZ. I also plan to run an injected 7K in my KP Starlet (carbed 7K ATM) and run it on FreeEMS. So, i understand if others have priority, but if this bad boy will take SATA drives and doesn't cost many hundreds of $$ to ship to Auckland, NZ then i will be super keen! Does it come with the SPs, FC switches with port licenses or are they just the DAEs?